This document will provide instructions for logging in to a service that requires Duo Multi-factor Authentication. Navigate to the page that requires Duo Multi-factor Authentication after NetID login (for example MyUW). You will now be presented with the MFA-Duo screen. Before following these steps, make sure you've already registered your smartphone or tablet. Steps to do so can be found here: MFA-Duo - First Time Setup for Smartphone or Tablet. When prompted for MFA-Duo, select Send Me a Push. Note: Checking the box next to "Remember me for 12 hours" is optional. More information on this feature can be found here: MFA-Duo - How can I use the "Remember Me" function? 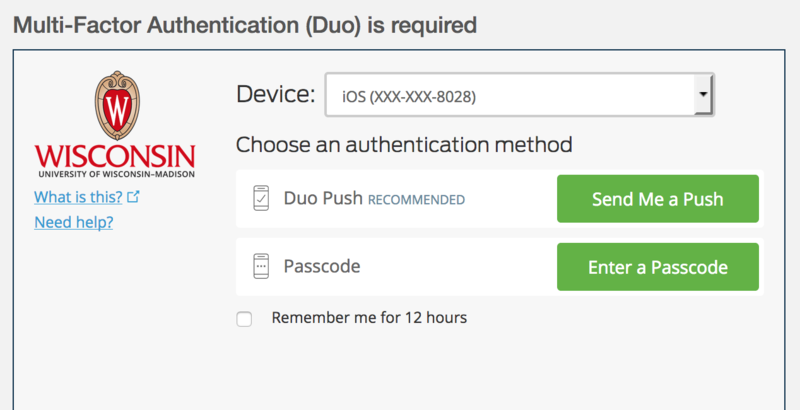 Tap the Duo Mobile notification you receive on your device. Tap APPROVE to approve the login request. After doing so, the notification on your device will go away, and you should be successfully logged into the service requiring Duo Multi-factor Authentication. Note: Tap DENY and then tap It seemed fraudulent if you ever receive a Duo Mobile push notification on your device that you aren't expecting. This feature is great for situations when your phone doesn't have a stable cellular data or wifi connection. This feature can even be used with your phone is in airplane mode or when you are traveling outside of the US. At the MFA Duo prompt, select Enter a Passcode. Click the UW Madison item in your app. A 6-digit passcode will be presented. Enter that passcode in the MFA Duo prompt to complete the login process. If the code doesn't work, click the refresh icon next to the code to generate a new code. The code below is simply an example and not to be used to login. When prompted for MFA-Duo, you will be given the option to Enter a Passcode. Note: if you have more than one device registered, make sure you select your token from the dropdown menu at the top of the MFA prompt. Make sure that the token's button is oriented to the left (as pictured). Press the button on the front of your MFA token. 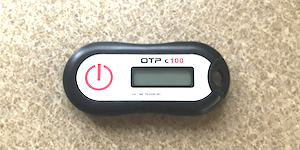 Note: If you are NOT using one of these tokens but are using a USB Device, see: MFA-Duo - How to Use a USB Security Key. The token will display a 6-digit code. Enter that code in the prompt, then select Log In. Before following these steps, make sure you've already registered your USB device to your account. More about that here: MFA-Duo - How to Register a USB Security Key. When prompted for MFA-Duo, click Enter a Passcode. Verify that your USB device is plugged into a USB port on your computer. Making sure your cursor is in the passcode field, press the button on your Feitian USB device. The passcode field should automatically populate with a six-digit code. If you have any issues or questions, please contact the DoIT Help Desk. You should be successfully logged into the service requiring Duo Multi-factor Authentication.